KING KON - Lou Johnson - the King of Cons! 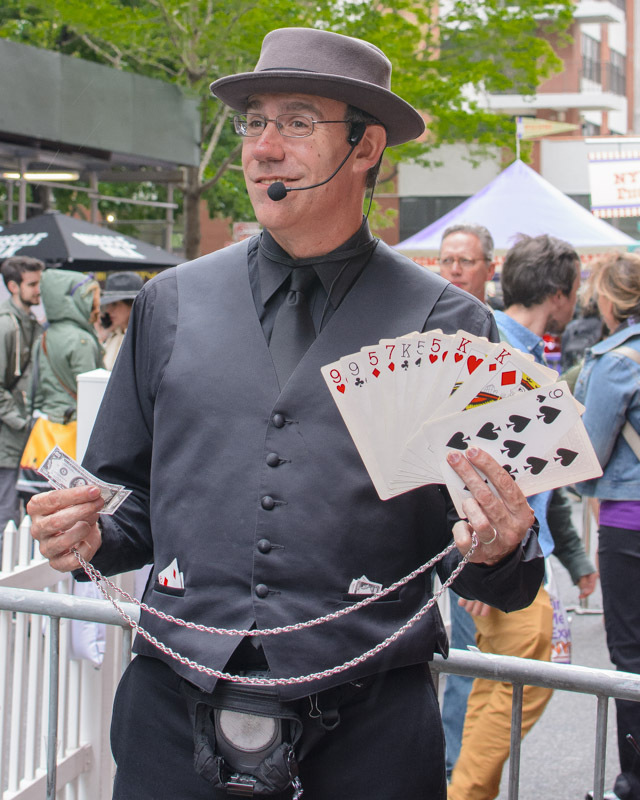 From Chain Swindle to Poker deals to a new Dice Stacking Demo and more, Lou’s card and casino tricks draw the crowds in and keep ‘em right there! His astounding Three-Card Monte is guaranteed to bemuse and bewilder - after three full hours at a recent college event, the audience still could not locate the Ace! Plus enjoy plenty of FUN with the WOW factor for your guests with my Close-Up Magic. Cards, coins, rope; handkerchiefs and borrowed rings and money appear, vanish and sometimes even in THEIR hands. Award winning and versatile, Lou's creative magic plays BIG! (Hey, he's 6'6". Everyone can enjoy the show!) They'll see him stroll with effects from his suit (many color choice options). Multiple hours is his specialty. While others say no, Lou is just getting warmed up. He makes the best choices for your themed event. Lou’s show props are portable, and he always carries a beltpack mic with music to ensure your guests know where the action is! 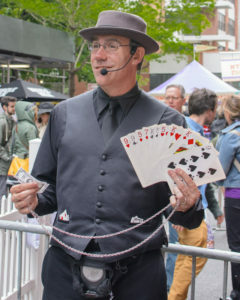 He is keenly aware of the importance of marketing during his performances, and will incorporate logos and/or products and product giveaways into his magic shows per contractual guidelines. For NYC Themed events, Lou's King KON Character is a WINNER. Your guests will love playing along with funny money (His or Yours) Call for details on KING KON for your Trade Show or NYC event!